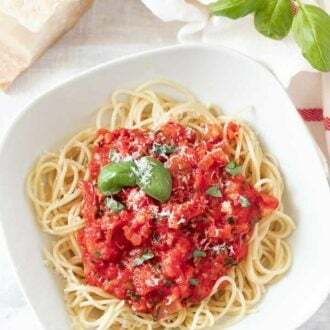 Fresh Tomato Sauce made from juicy, ripe tomatoes tastes so flavorful and makes a perfect dinner together with your favorite pasta and topped with parmesan cheese and fresh basil! This simple recipe for marinara sauce is the perfect way to use up all those fresh summer tomatoes. Fill a large enough bowl with ice water and put it beside the stove. Cut an x across the bottom of all tomatoes and put the tomatoes in the boiling water for 60 seconds. Use a slotted spoon and transfer the tomatoes to the ice water bowl. Let them sit in there for 1-2 minutes. Then remove the skin and roughly chop the tomatoes, discarding the stems and any white flesh. Set aside. Heat the olive oil in the (empty) pot over medium heat. Add the onion and saute for 4 minutes until soft. Then add the garlic and cook for 1 more minute. Add the tomatoes and their juices and increase the heat to high. Season with salt and pepper. Bring to a simmer then add the sugar, basil, and thyme to the pot and reduce heat to medium-high. Cook for about 15 minutes until the tomato mixture has thickened and is reduced to about half. In the meantime bring a large pot of water to a boil. When it’s boiling add 1 Tbsp of salt and cook the pasta according to package instructions until al dente. Add ½ cup of the pasta water to the tomato sauce and adjust the seasoning, then add the drained pasta to the pot and toss it with the sauce to combine. Serve with grated Parmesan cheese.